How much should I pledge? Pledging is a spiritual practice, a commitment to the future of the congregation. The practice of making a pledge and following through with your commitment is just as important as the amount. 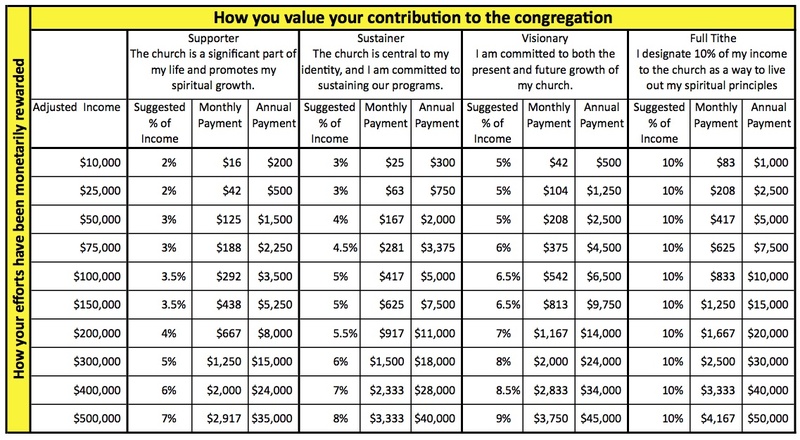 Some congregations have a minimum amount you need to pledge in order to be a member. This number is often arrived at by church leadership and usually covers some basic costs associated with membership. There is often a provision that members in financial difficulty can request a waiver of the minimum (this request is often made of the minister and needs to be made each year, if it is requested over multiple years). However, “minimum” amounts rarely exceed $15 a month; they really are a minimum. And you don’t need to be a member in order to pledge. Many congregations have a “friend” category for congregants who want to pledge but don’t feel ready for membership. What if I have a financial emergency and can’t meet my pledge? Just let the congregation (most likely the minister, treasurer, or bookkeeper) know as soon as possible. How do I pay my pledge? The most important part of paying your pledge is letting your congregation know it’s from you, so your donation can be tracked. Cash in the offering basket works if you attach a note or put it in an envelope indicating it’s from you. Checks should indicate “pledge” in the memo line. Many congregations accept credit card payments through their websites or at kiosks on site. Mailing a check (monthly, quarterly, annually…whatever works for you). Most people can arrange for their bank to automatically send a check for a certain amount each month. This is one of the easiest options; you can schedule the monthly check, and then you’re done. The work for the congregation comes when people haven’t kept up with their pledges. My congregation sends quarterly reminder statements; I’m sure most congregations do. One of the greatest gifts you can give your congregation is to pay your pledge in a timely manner. I volunteer my time. Isn’t that enough? If all congregants volunteered time and donated no money, churches would cease to exist. Likewise, if all congregants donated money and volunteered no time, churches would cease to exist. Both kinds of giving are important to create and sustain a vibrant and thriving religious community. Hopefully, you are entering into a long relationship with the community you are supporting. You may have intervals when you can volunteer more than you can donate, and you may have other intervals when you can donate more than you can volunteer. This is why you are asked to pledge annually. Your circumstances can change, and what you are able and willing to donate may rise and fall. In Buddhism, generosity is the first perfection on the path to enlightenment. In Islam, one of the five pillars is the practice of charitable giving. In Judaism, giving to the poor is understood as an obligation, an act of justice and righteousness, not charity. In Christian tradition, Jesus taught that it is better to give than receive. Pagan tradition holds that whatever you give away returns to you three times over. The practice of receiving an offering during the worship service is a reminder that generosity is a significant component of living a spiritually robust life. Previously: Giving Money (Part 1 of 2). One Response to "Church 101: Giving Money (Part 2 of 2)"
I guess I “tithe” differently, in that I give 5% to my UU fellowship and 5% to the Jim Collins Foundation (a charitable organization dedicated to helping transgender people fund their transitions).